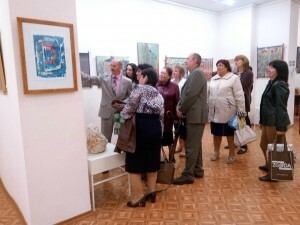 Pupils of Mykolaiv Community College named after V. D. Chaika have visited an exhibition of Kateryna and Volodymyr Nemyra, that takes place at the Art Gallery of Petro Mohyla Black Sea National University. Serhii Sichko, the director of the college, and Valentyna Sichko, the art manager of youth bandura players’ chapel “Cossacks’ jingle (Kozatskyi Peredzvin)” initiated the pupils’ acquaintance with the creativity of the artists from Lviv. Kateryna Nemyra was present at the meeting with pupils. 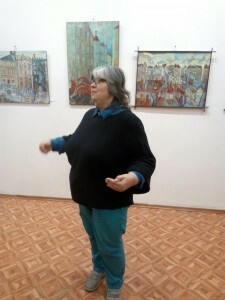 She has shared different stories from her life with the pupils and also thanked them for being interested in her works. The artist has wished the pupils to have creative success and effective school year. 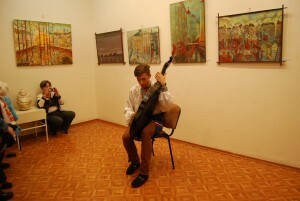 College pupils have also prepared a pleasant surprise for the artist. They have shown her their vocal and music talents.